Human condition or the problem about our origins. The conception of a classic phylogenetical tree associating all Vertebrates in accordance with the Haeckelian model kept until today thanks to a regular immobility in science, but also through a certain hold on a very sensitive point of our scale of references from the part of the palaeontologists : I want to speak about the date on Man’s origins. It has become a commonplace thinking that Man, in his "modern" version, as Homo sapiens, differentiated or specialised not long ago in the geological scale, from being a half-ape struggling through some generations with standing erect. It is quite normal, in one sense, to discover in very old sedimentary layers the fossilised remains of Hominoids with thicker skull bones, or with a "heavy" skeletal structure, rather than to find the remains of individuals of delicate aspects, like the bones of Homo sapiens. In some other aspects, Australopithecus afarensis ( = "Lucy", in its 3 MY-old form ) looks just as a composite species which associates several closely allied or even non-connected forms, of similar morphotypes, yet far away in time from each other, more than one million years ! Each author, according to his own particular sensitiveness, makes the species africanus habilis or ( Homo ) erectus derive from his own selection of previous palaeontological patterns ! In order to compare my individual conception of the Human evolution to the usual comprehension of a genealogical tree of Man’s origins, I drew a scheme just as fig. 1. In this purpose, I was careful to trouble neither the chronological time-table, nor the regular position of the current fossils ( on the left ), but I actually put the Hominid remains on the track of dehominization, i.e. they are branching off in many ways from the central and chief trunk representing our immediate ascent ( on the right of fig. 1 ). The facts drawn from experience and the studies on early embryonic stages prove anyway the dehominization in a natural propensity to all the Hominoid lineages. From an anatomical point of view, our species Homo sapiens has remained essentially primitive in comparison to all the other Mammals. Fig. 1	Comparison of the Genealogical	Trees of Man’s	Evolution for the last 4 million year. Left : the evolutive scenario as proposed by the palaeontologists. the branches on this picture exhibit, in a graphic representation, as many dehominized outlines. The very primitive and essential characteristics of the first Vertebrates is indeed that of a big fundamental brain. All those authors having written upon the subject ( WESTENHÖFER 1935, FRECHKOP 1941, SNOO 1942, HEUVELMANS 1954, SARRE 1988 ) have up to now insisted on this significant point... It is because we have been keeping our big brain that we have remained bipeds ! Thus, all known morphological types in nowadays and ancient Vertebrates could be derived from the basic bipedal model with its globular brain. So we may obtain : human beings, hominoids, anthropoids, semi-erect bipeds with or without rest of their tail, flying or swimming forms and, at last, apodal ( "without legs" ) forms ! First, and totally according to the concerned diverging lines from a bipedal prototype, some early characters such as homoeothermy or placentary viviparity, subsist or fade away, until in a second time, still more profound characteristics are involved into the transformation of the whole shape ( for instance, through the loss of the original heterodonty...). In such a case, we should speak of a reptilization. The former mammal changes into a reptile ! The problem of a new taxonomy of the Vertebrates would then be to reorder the heterogeneous groups ( Reptiles, Amphibians and Fishes, especially ) composed of different animals whose only resemblance was their appearance ! Issue within the framework of the Initial Bipedalism Theory, the target of this thesis ( which is personal to the present writer ) is to give a rational and historical-evolutive explanation to the problem of the formation of a big globular brain in the first bipedal Mammals. As already exposed and related in detail ( SARRE 1988, 1989a and 1992a ), we should here be talking of an ancient apical organ that was conceived originally as a spherical float in a marine full-water creature I called : homonculus at the archepagogic stage. What may be called the exodus out of the water of the first Vertebrates endowed with a terrestrial vocation would then not have been the fact of a "classical" Crossopterygian fish whose fms changed into legs, but the work of the bipedal amphibious homonculus, whose organism just adapted to the possible transition from the marine sphere to a strictly terrestrial habitat ( SARRE 1989b, 1992b ). On the level of the Classification of the Vertebrates which is the subject of the present article, this Marine Homonculus hypothesis obliges us to entirely revise the common criteria nowadays in force... The fossil record will not give us- it should precisely have been its task - but some indications about some extinguished forms of remote faunas ! There will not be any need to reconstitute, going from a few shattered bone fragments, the phylogenetic tree of whole groups by arranging them into one row going from the oldest to the newest "more evolved"... It would better be emphasized on physiological accounts and on the basis of objective anatomical studies ( including embryological facts ) of the natural groups concerned ! The aim of the present article is not to establish a Zoology Treaty, but to prepare it... We should here only make some allusions to the Systematic of a few groups among the Vertebrates. The Dinosaurs, Birds and Crocodilians often have been gathered in the taxon of the Archosaurians ( GRASSE 1970 ). In this way, the Crocodilians were phylogenetically close to the Birds, and all of them would descend from some pre-Dinosaurian ancestors. The research of Max Perütz ( Nature, 291, 1991 ) on the variants of sequences of aminoacids in haemoglobin would favour the attempt of a common line leading to both the Birds and the Crocodiles, in a separate way from the line evolution leading to the Mammals ! This is a disguised allusion to the common fact that all these groups have "evolved from the Reptiles". This opinion surely could be reactualized through new biochemical discoveries. Yet, the station of a "reptile" appears to be absolutely essential, as far as the evolution of Mammals, Birds or Dinosaurs is concerned ! This way to proceed completely distorts the whole rapprochement to the problem... and its results ! And nevertheless, the more ancient dinosaurs are exhumed ( the newest one dug up, Eoraptor, is 225 MY old ), the more it seems certain they issued from small and swift bipeds, and not at all from big sluggish saurians ! Within the framework of our Marine Homonculus Hypothesis, the reconstitution of the evolutive history of the Dinosaurs can be made without any difficulty. In the beginning, they were little bipeds, equipped with long runner legs and a lengthy tail. The food specialization ( meat-eaters ) reshaped the head structure of the otherwise round skull, while the jaws grew mighty and became wellfurnished with sharp and cutting teeth. They from then on swallowed their preys and did not masticate anymore ! In the beginning of their lineages the Dinosaurs still were homoeotherm ( warm-blooded ), viviparous and pilous. But they kept on reptilizing. Many later forms, like the big herbivorous saurians ( Apatosaurus, for instance ), used to run on all four and to lay eggs... So they have become quadrupeds, too, like the majority of the known Mammalian forms ! On the one hand, Archaeopteryx, a far cry from being a "primitive" bird, is in reality nothing but a aberrant representative of the Aves class being itself already deeply engaged in the process of reptilization ! Archaeopteryx was found in Jurassic sediments, but it could have lived among any other fauna of the Mesozoic, even in recent times ! On the other hand, the "classic" bird also represents a very advanced stage in the Avian series. Our birds today do not have much in common with the supposed aspect of the first Aves that once developed : just like a big lizard with a cat ! I would even go further postulating that all known birds represent avian forms... which are currently reptilizing ! Like the Dinosaurs, they have radically changed their feeding habits, gulping down their food, too. The initial dentition was replaced by a beak : i.e. a sort of horny holster also covering jaws and mandibles ! The character of homoeothermy was retained for reasons linked to the flight metabolism. The reproduction became henceforth assured through the egg laying, like for most of the Reptiles. In all possible cases, it is probably from this very early evolutive stage that comes the acquisition of the particular characters of the Birds, i.e. the transformation of the forelimbs into wings, that of the hind legs into "take-off" and "landing gear", the formation of the feathers and that of the airbags and airpipes in bones to lighten the whole body structure. What we are calling "birds" are in reality only their reptilized descendants ! Man is characterized by his anatomical non-specialization and structural primitiveness among all other Vertebrates ( the archaic hand with 5 fingers, for instance, just as the big globular brain ! ). A far cry from being the rural result of evolution, Man, on the contrary, is what has closely remained of the ancestral Vertebrates’ prototype... A fact which Embryology fervently confirms ! The diverse lineages of Vertebrate animals arise, as so many bifurcations do, from all sides of the central trunk symbolizing Man’s line of ascent ! With the intention to illustrate such a conception of the evolutionary history of the Vertebrates, integrating the data given by the Marine homonculus Hypothesis, I will suggest a scheme like that in fig. 2. With preference to the usual taxonomy, I will still presume the notion of the Branch of the Chordata : all those animals with a spinal chord ( see on the bottom of the picture ). Indeed, the first ancestral members of this branch were acephalous ( headless ) creatures with a nervous system that only had its seat within the spinal chord ( = it was before the formation of the globular floating, nowadays our cerebral brain ). This taxonomic level includes not only the ancestral Precambrian forms and the Vertebrates but also those groups like, for instance, the Tunicata, the Acrania and other animals generally called invertebrates. 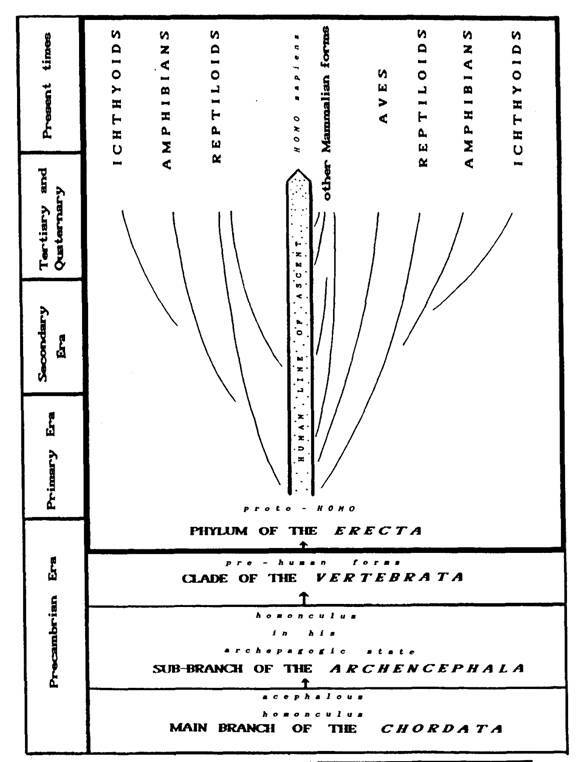 On the next taxonomic level, that of the Sub-Branch, I would not yet put, as usually, the taxon of the Vertebrates, but the Archencephala, a term originally created in 1868 by the English naturalist R. Owen, who gave it the sense of owners of superior brains ( from Greek arkhein, "to command", "to lead", indicating a superior quality, and kephalê, "head" ). So did Owen put the accent onto a fundamental character of the Human species. As far as I am concerned, I would surely make use of this term Archencephala by letting the first radical derive from Greek arkhaios, "ancient", "old"... Into the Archencephala I class the marine homonculus in his archepagogic stage, whose spherical floater just developped before it started to function as our cerebral brain. The next evolutive step is that of the Vertebrates ( to whom I would attribute the taxonomic value of a clade, that is to say a main stem in the modern use of taxonomy ). It is connected with all the characters generally devolved to the Vertebrates, such as the presence of a spine with separate vertebrae, whose osseous prolongation in direction to the apical pole becomes the skull ( containing the original big brain ), whereas 4 limbs and their respective ( scapular or pelvic ) girdles slowly come into being on both sides ( SARRE 1992a ). This view of the evolution of the first Vertebrates clearly sees their emergence under the form of terrestrial bipeds with an erect body posture. So I would like to revive and raise the old taxon of the Erecta to the rank of a Phylum. It was first introduced in 1811 by the German zoologist Illinger with the intention to place the genus Homo. A Phylum is the natural group or the biological unity consisting of the original form ( here, the biped Bauplan...) and its derived forms. The problem remaining now ( and not only because of a graphic representation, as shown in fig. 2 ! ), is that of a grouping in Classes ( Mammalia, Aves, Dinosaurs, Reptiloids, Amphibians, Ichtyoids...), then into zoological Orders and Genera. My diagram is only but reducing it to the basic forms in order to express what I wished to show ! 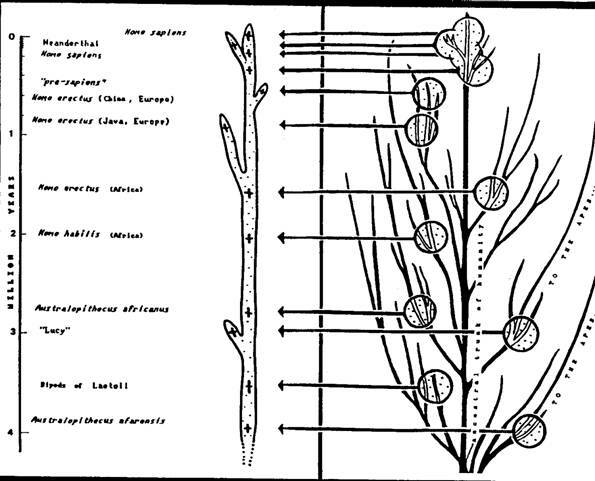 The present article only wants to lay the foundation of a new understanding of the taxonomy in Vertebrates which ought to one time replace the precedent classification inherited from the Linnean static and descriptive model having been used in science since more than 2 centuries, a model that cannot be representative for nowadays purposes and which cannot retrace the natural phylogenetic history of the groups concerned. I still hope that further subsequent dissertations about evolution and taxonomy will allow us to define precisely this way of thinking and will complete the inherent data of the submitted model. 1939 De la differenciation des Oiseaux. Gerfaut, n° 2 : 100-106. 1941 Remarques sur l’embryologie des Mammifères. Bulletin du Museum Royal d’Histoine Naturelle de Belgique, n° 17 : 1-6. 1970 Traité de Zoologie. Paris, Masson, 14. 1954 L’Homme doit-il être consideré comme le moins specialisé des Mammiferes ?, Sciences et Avenir, n° 85 : 132-136, 139. 1963 Protohominid behaviour in primates. Symposium of the Zoological Society, n° 10 : 61-68. 1988 Initial bipedalism : an inquiry into zoological evidence. Bipedia, n° 1 : 316. 1989a La theorie de la Bipedie Initiale. 3° Millénaire, n° 13 : 35-50. 1989b What did the first Vertebrate look like that entered land ? Bipedia, n° 3 : 17-21. 1992a The Marine Homonculus Hypothesis, an alternative paradigm for Human earliest evolution. Bipedia, n° 9 : 13-16. 1992b Kamen unsere Vorfahren aus dem Ozean ? Efodon News, n° 11 : 13-15. 1942 Das Problem den Menschwerdung im Lichte der vergleichenden Geburtshilfe. Jena, Gustav Fischer Verlag. 1935 Das Problem den Menschwerdung. Berlin, Nornen Verlag.